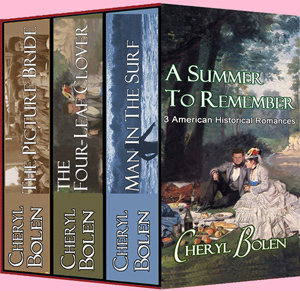 Award-winning, multi-published author Cheryl Bolen turns her attention away from the British Isles to craft three achingly romantic tales set in nineteenth-century America. Norman Sterling, the wealthy mayor of Peace, Missouri, shocks himself at his town's Fourth of July picnic by proposing to the beautiful Mildred Gresham, a beauty he's worshipped from afar for more than six years. Equally as shocking is Mildred's quick acceptance. If only he were possessed of a silver tongue, if only he could tell her how truly he loves her. Millie comes alive in Norman's arms, but her reticent husband never tells her he loves her. As he grows more distant she is tormented that he loves another. Will she ever be able to secure her husband's love? Since seeing Jake Madison stride gloriously naked into the moonlit Galveston surf, Elyse Bonham, daughter of the island’s wealthiest man, has lost her heart to the handsome island visitor. But how can she convince her overprotective father that Jake is worthy of her hand? He had selected her to be his bride based solely upon the picture of her in her kimono, the picture taken back in her village before the long, miserable ocean voyage which would bring her to the man who would be her husband. . . The Picture Bride is a prequel to Cheryl's beloved historical novel IT HAD TO BE YOU.